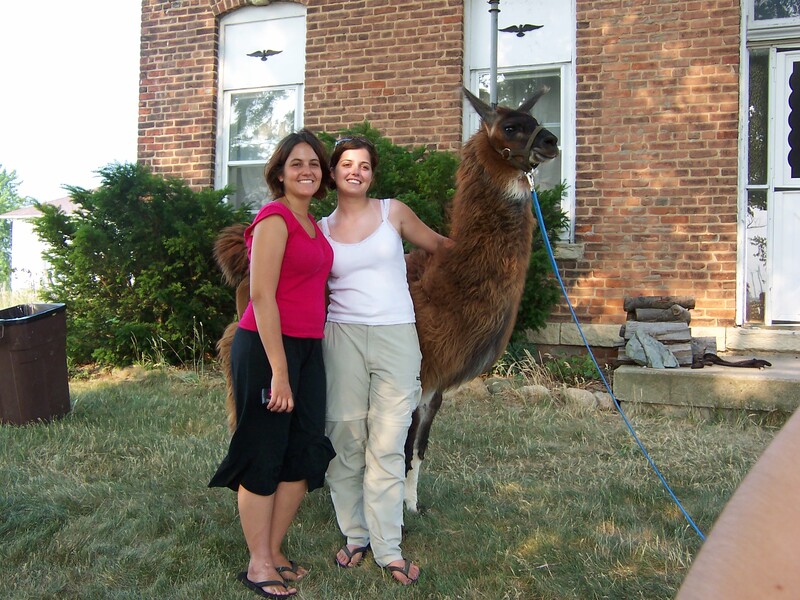 Llamas and Alpacas originated in the Andes of South America and are adapted to cold weather but, unfortunately, not to our hot summers. 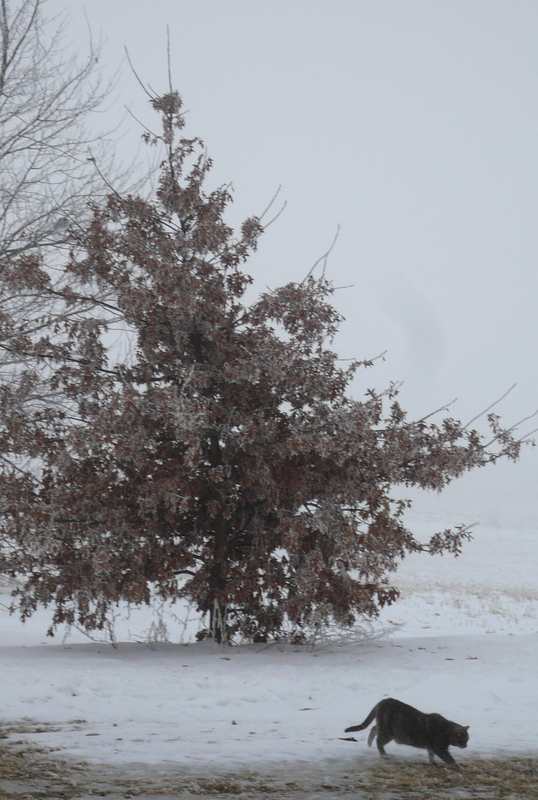 To keep them comfortable in the Midwest you need to give them an annual haircut. I admit that the first year we owned them we attempted this ourselves, inviting all our friends to “help” us! 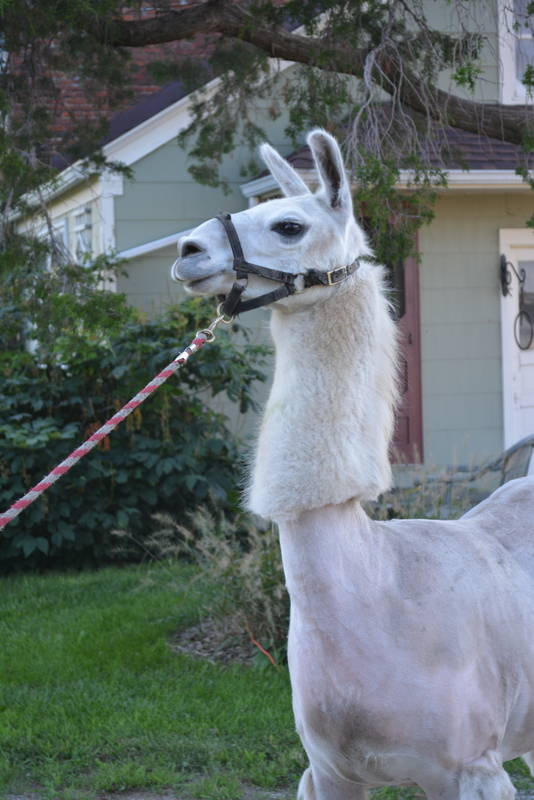 We bought our llamas in Pinedale, Wyoming. With an elevation of 7,000 ft. summer heat was not an issue. 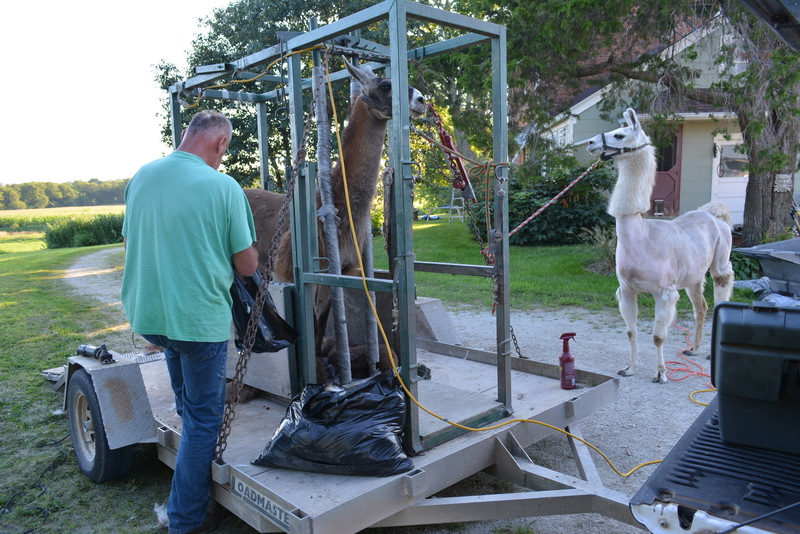 When we first sheared them it was the first time for them – not that they like it any more ten years later! 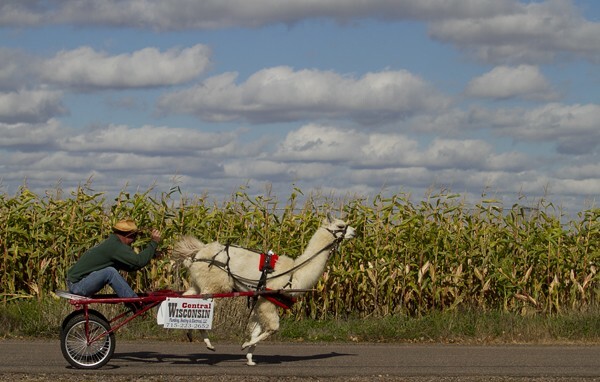 Then I discovered Floyd Zopfi, a Wisconsin Llama aficionado who comes each year hauling this contraption behind his truck. 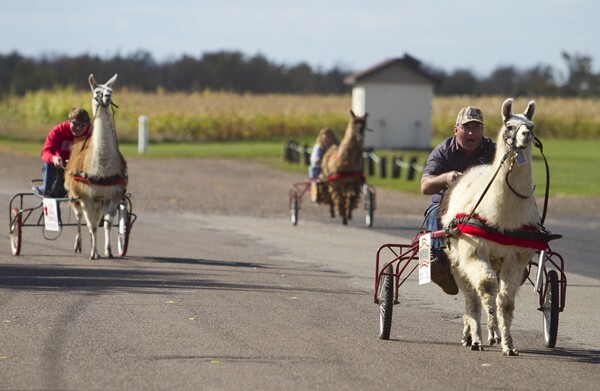 Floyd has been a godsend to us as well as to the many farms and zoos that employ him throughout the Midwest. And what an interesting fellow he is! 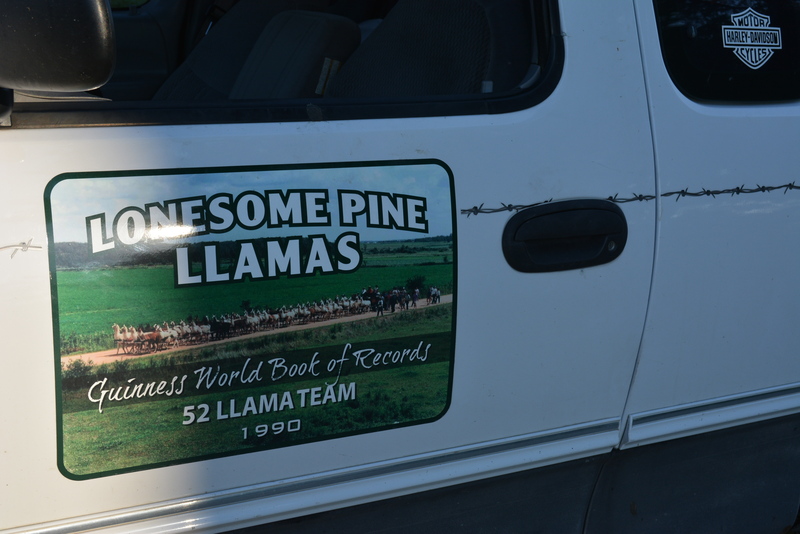 Floyd set the Guinness Book of World Record for using 56 llamas harnessed to a single cart, a fact that he displays proudly on this truck. 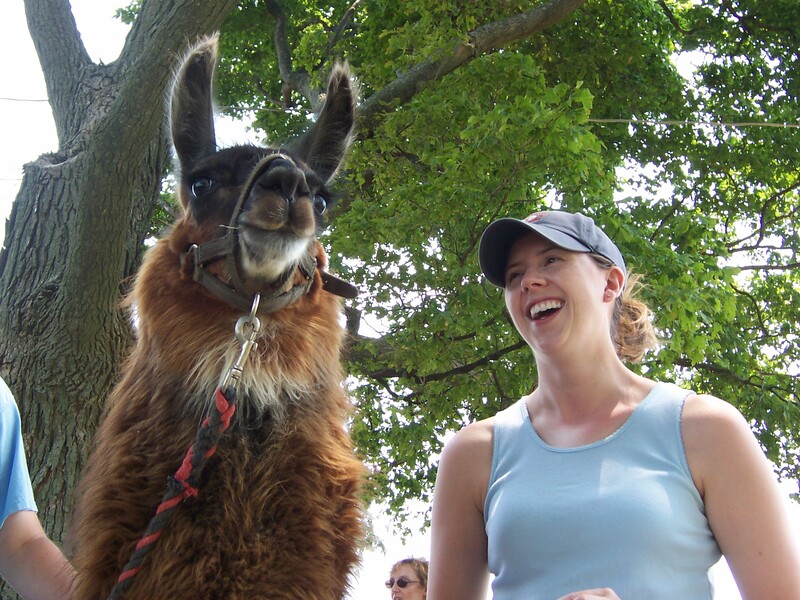 He and his llamas are quite a spectacle at the Labor Day parade each year in Janesville, Wisconsin. 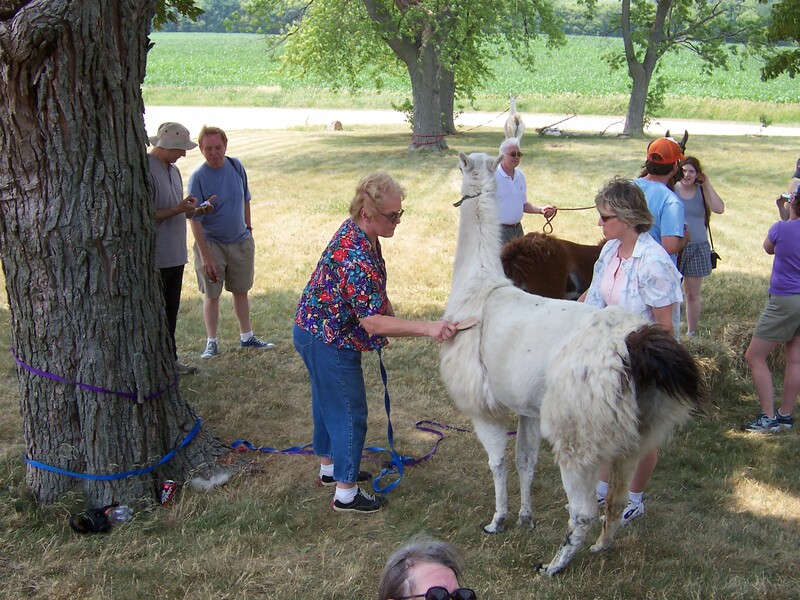 Did I mention how much llamas HATE to be poked, pricked and prodded? I opted for the complete cut this year as Lefty managed to get himself entangled in burdock, yet again, leaving him looking pretty silly indeed! I end up with several bags of fiber which I gladly give away. Any takers? 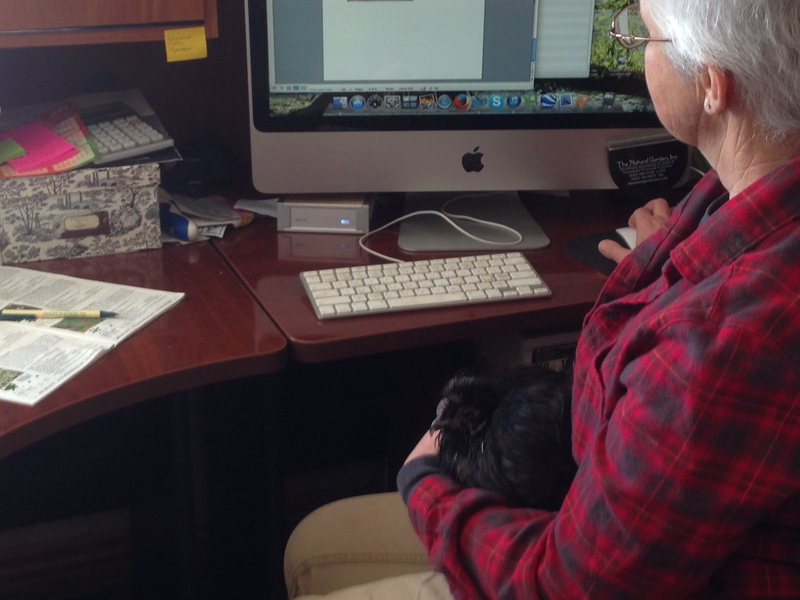 What do you do when your companion – yes, a CAT – just goes off and disappears one day? Yes, CATS. They are – you know – expendable. She was our very first Critter at our country home. 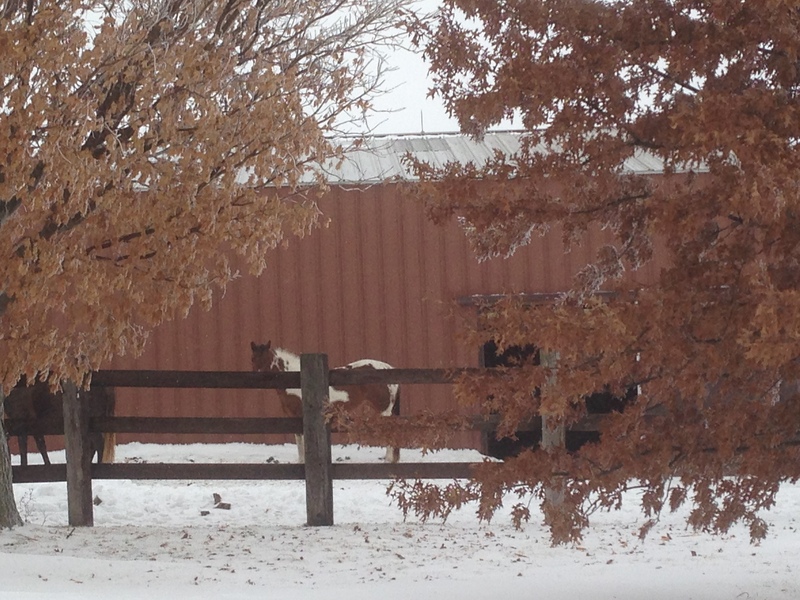 She just appeared one day in the barn, lonely, hungry, and very, very shy. I had to coach her out from some dark corner. Eventually we became friends. A trip to the vet confirmed that she was a spayed female. Could she have been released by someone who no longer wanted to care for her? Yes, people do that. 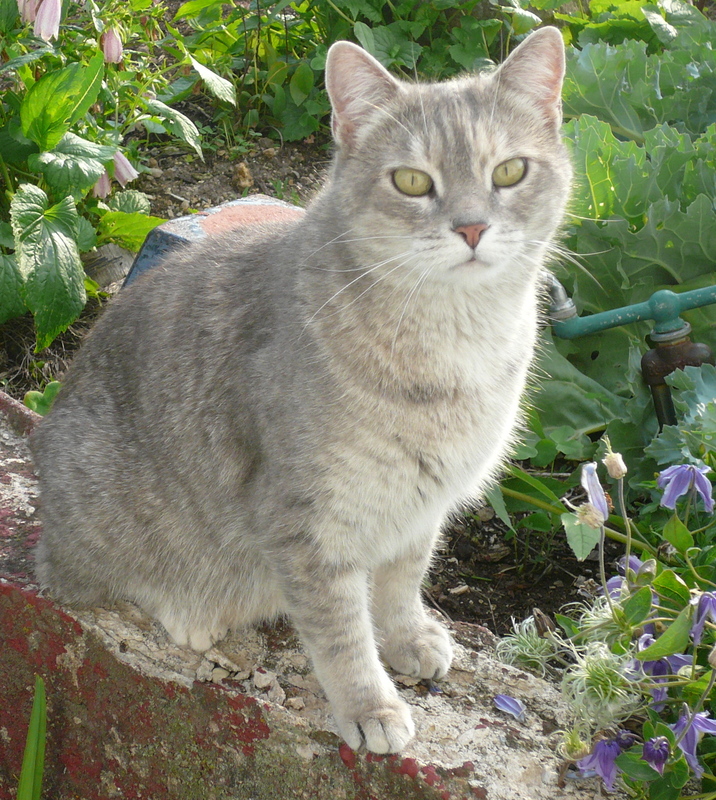 We never did find out her origin but we did get to know all her peculiarities as cats are wont to have. 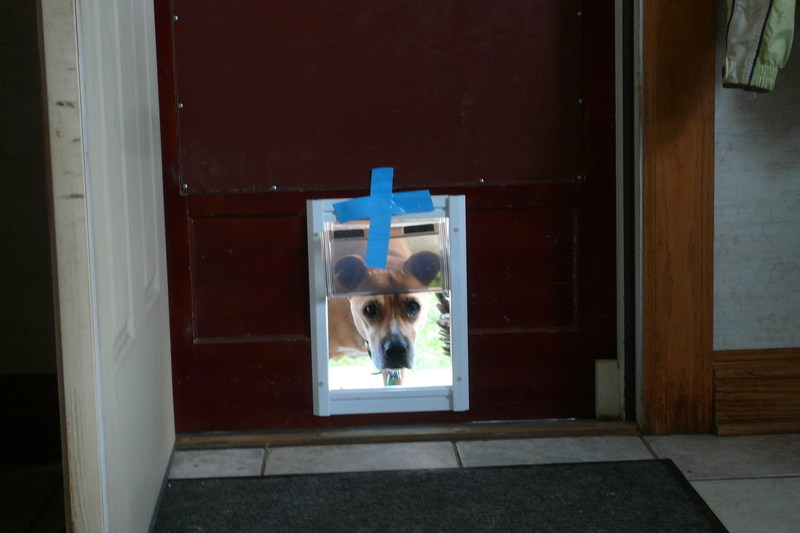 She never liked using the new kitty door. But the dog and the chickens thought it was swell. 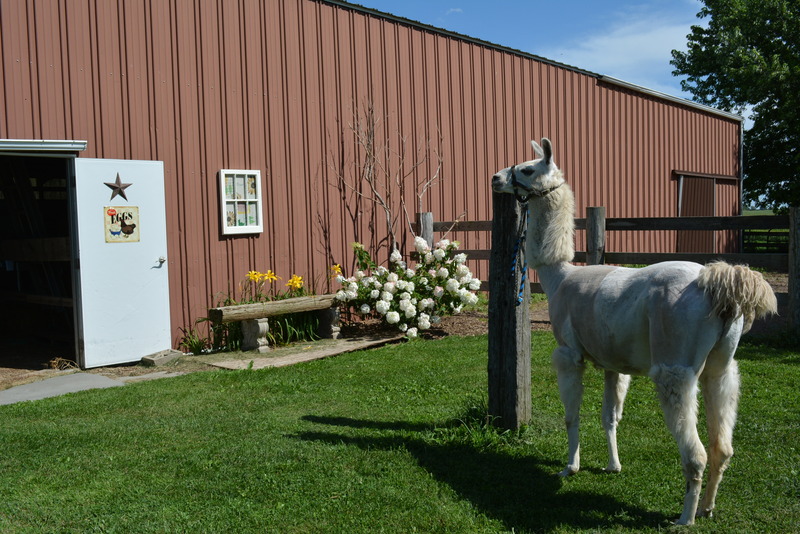 Ella – Ella Fitzgerald – preferred the barn but loved to just “hang out” with me whenever I meandered the premises, weeded, or tended. She had an unusually thick coat of hair, a very soft purr along with a sweet, shy nature. She would “meow” with no discernable sound. 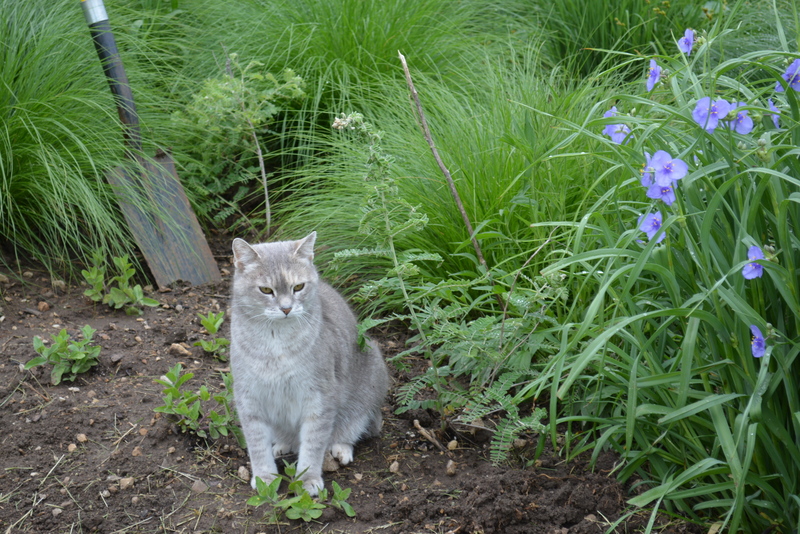 Always predictable, whenever I walked out the back door, she would tag along with me as I did my chores. She never disappeared for days as Baseball, the male cat, sometime does. 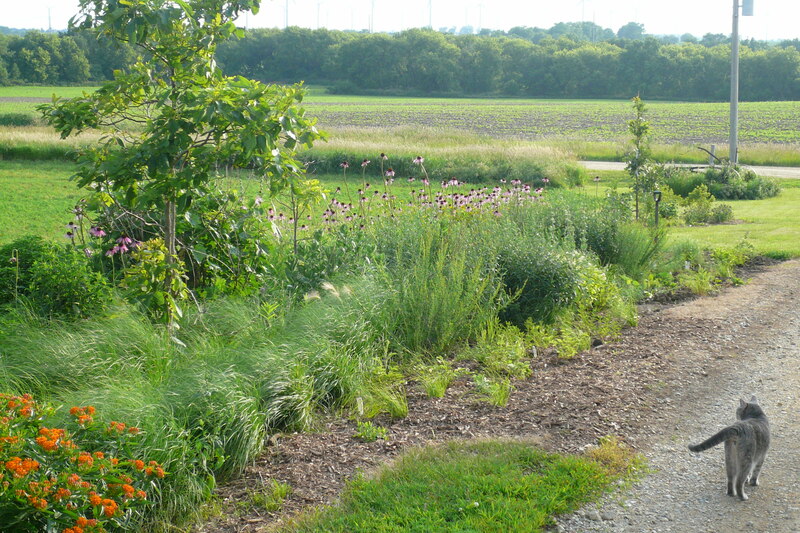 Coyotes howl at night, fox prowl the fields, enormous farm implements crawl slowly over the crops. I miss my companion and just wish I knew . . .
She is currently living in my kitchen, where she has been defrosting. It took about three days. I found her about a week ago keeled over in the snow when I accompanied my friend, Janet to a neighbors house to do chores while owners were out of town. 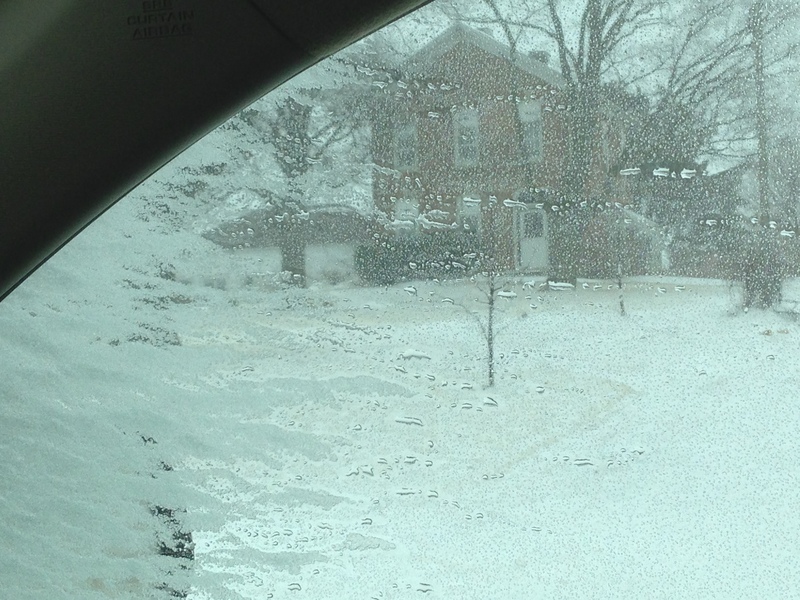 So, that’s how she ended up going home with me to defrost. She and I have not left the kitchen since. There is a nice tall electric heater in here that rotates, sunlight streams through the windows on the south, and I can always bake banana bread or muffins, then leave the oven on for the rest of the day. She will sit on my lap as I browse the Internet. 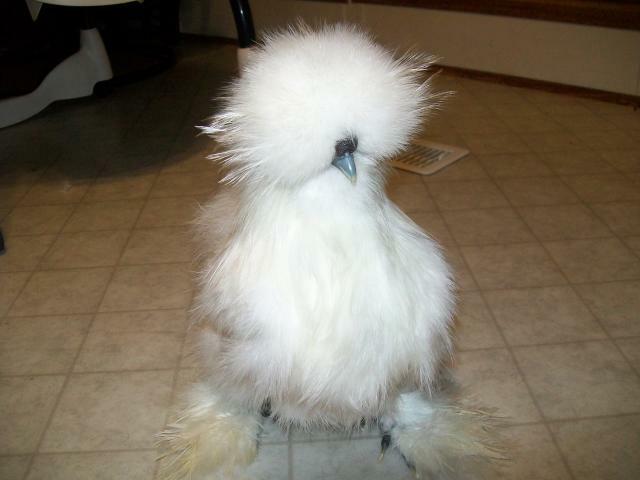 I learned that she is a Silkie, so named for fluffy plumage that feels like silk. 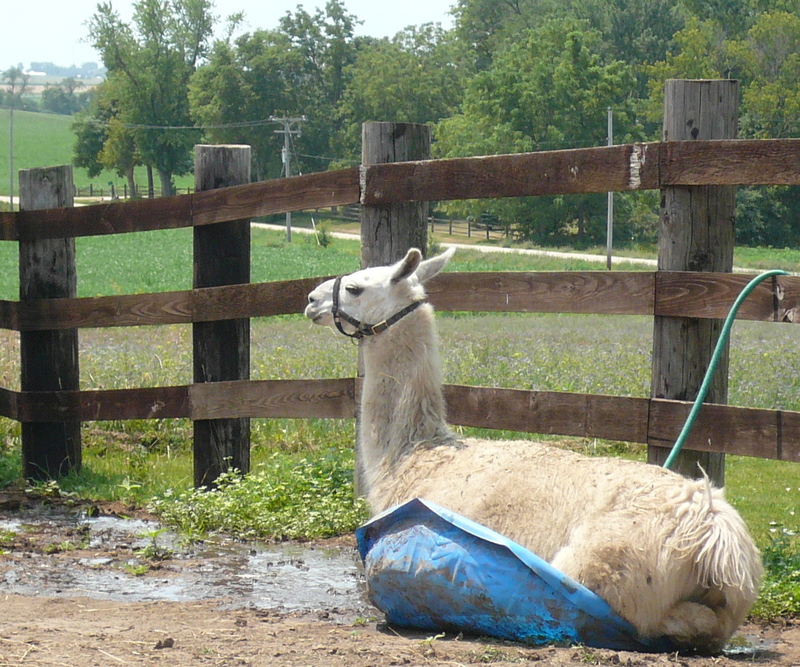 They are a favorite of children and known for their broodiness. 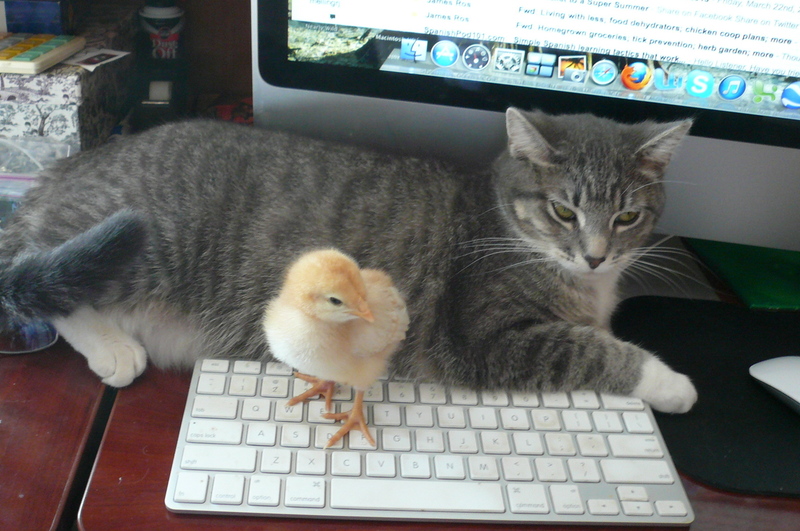 That means they like to sit on eggs, often stealing eggs from other chickens! 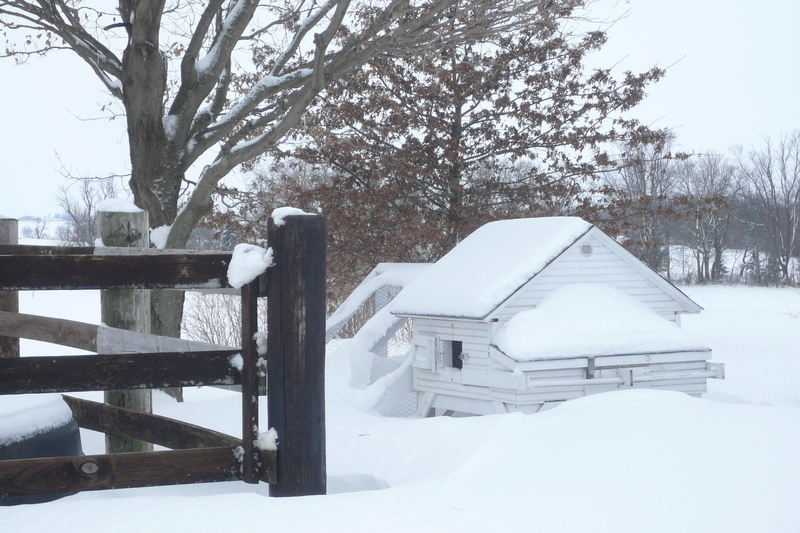 I can’t imagine returning her to her former digs which did not have heat, nor can I imagine adding her to my small flock in a cold and drafty barn. 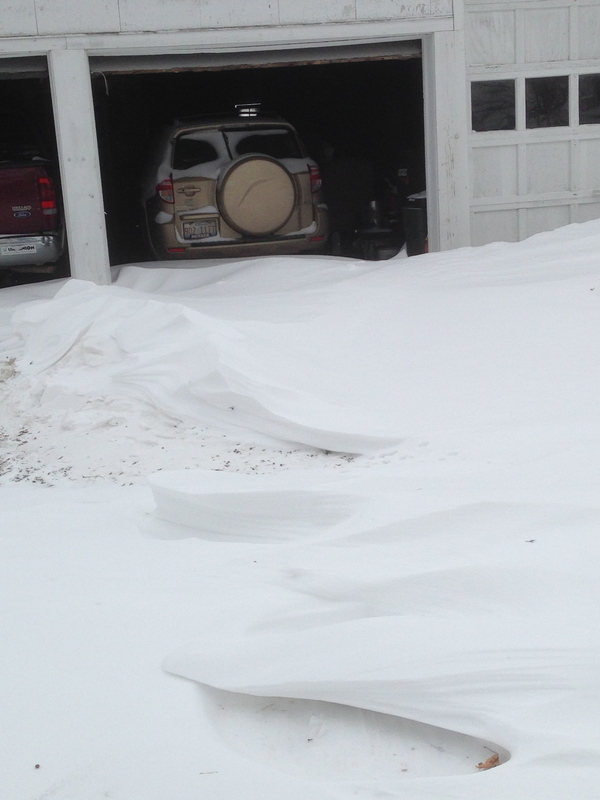 My “brooder” outside is covered in a snow drift, also with no heat. 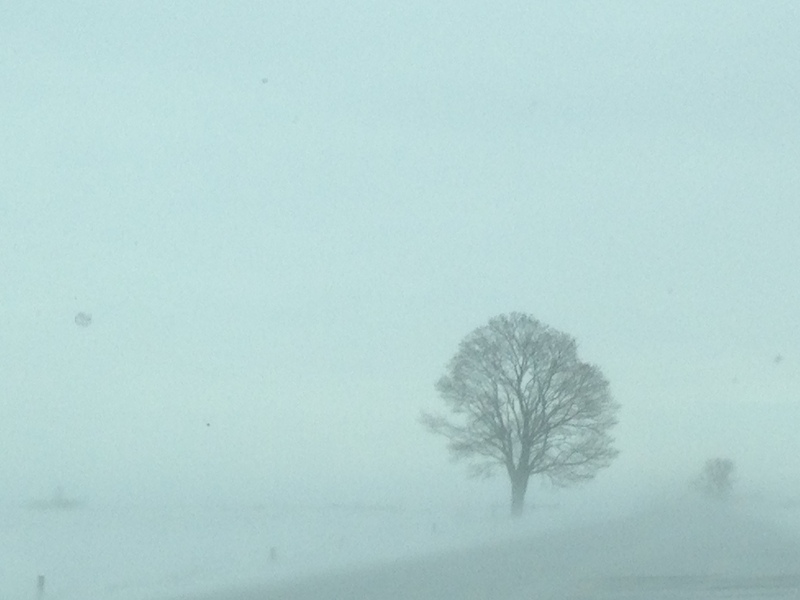 Every day we face yet a new winter weather challenge. 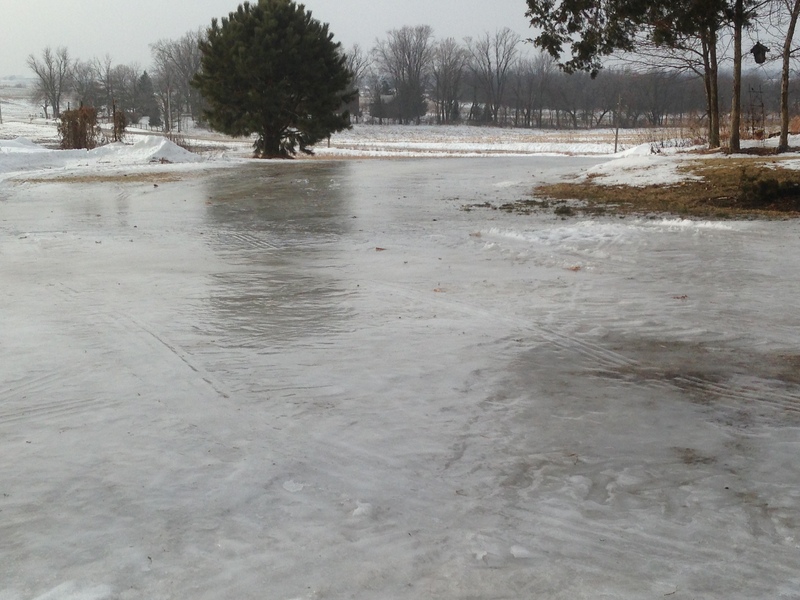 How grateful I am I can remain safely at home. 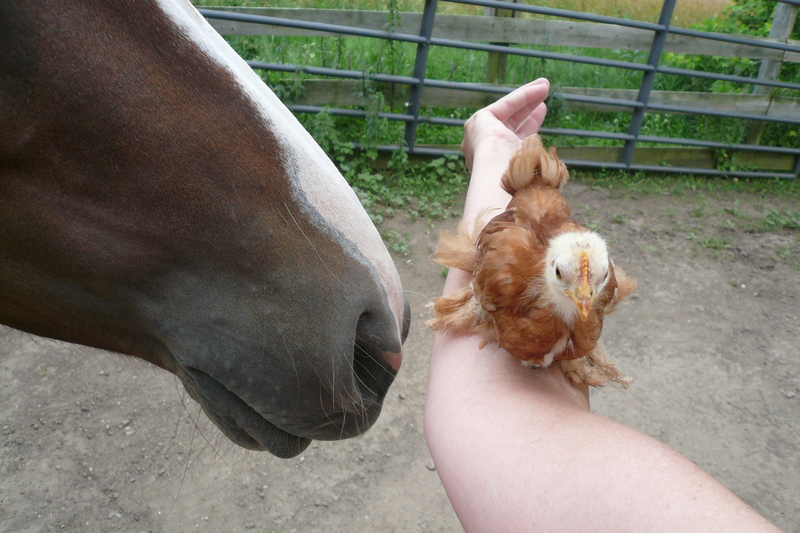 To commune with my chicken. The road to Marans eggs has been a LONG ONE. Three years for crying out loud! So how did I become so obsessed with raising Marans? Probably too much time sitting at the computer in the winter. 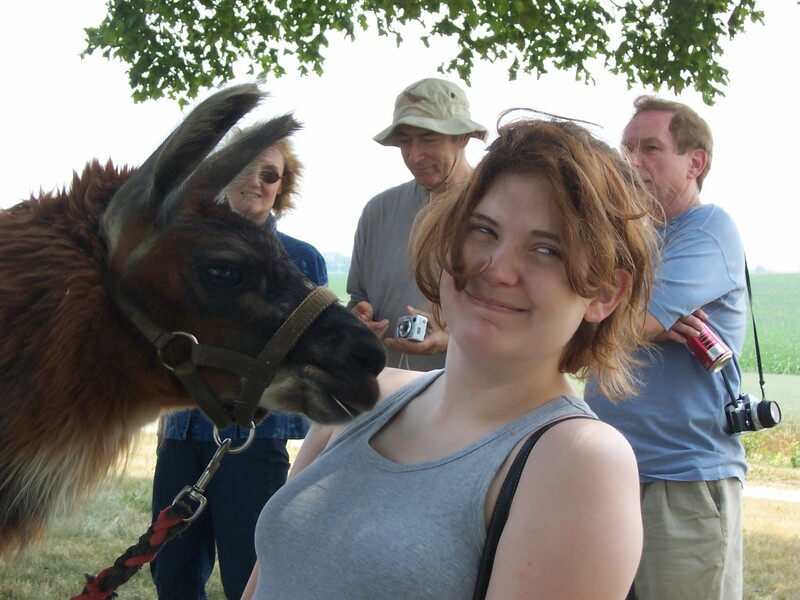 But much safer than looking at horses! 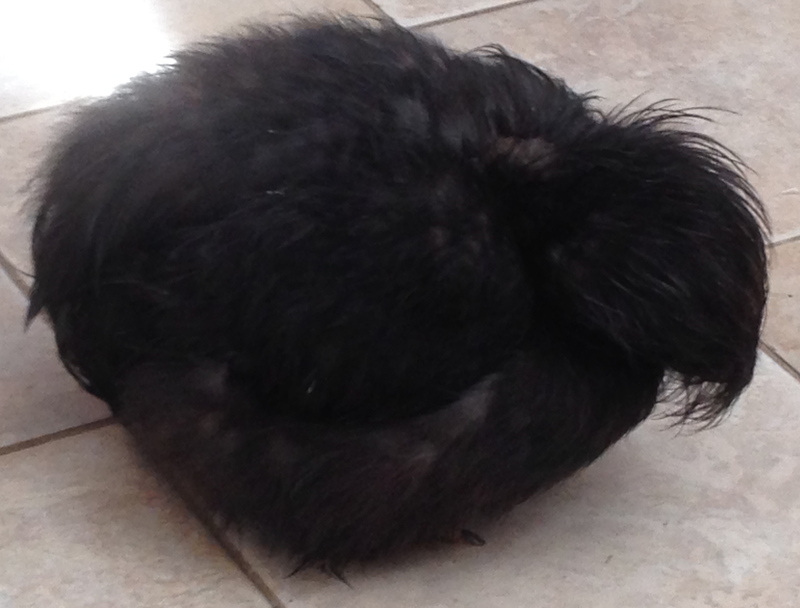 Marans are a breed that originated in France and are noted for their extremely dark eggs. 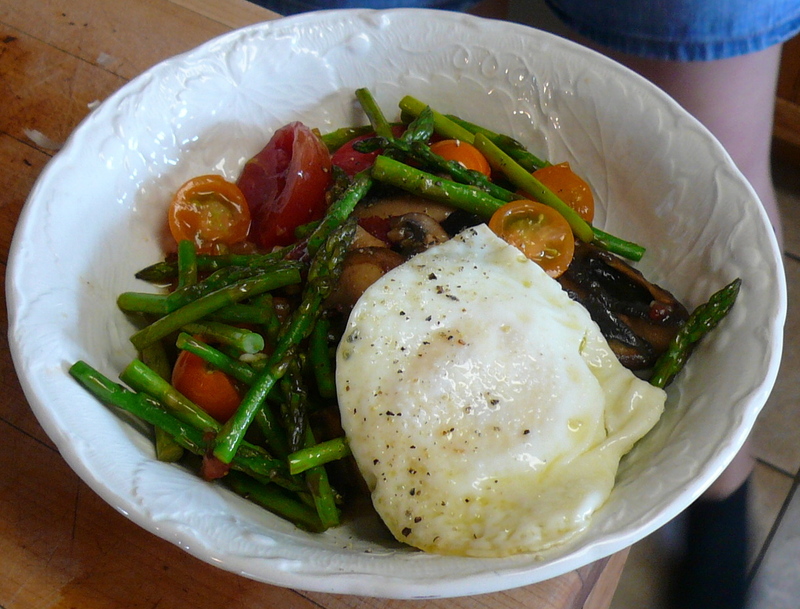 They are the preferred egg by many fine chefs including James Beard. Ian Fleming, the creator of the James Bond novels, made Marans eggs Agent 007′s favorite. I came back from my working weekend at The Chicago Botanic Garden to a whopping 22 eggs, five from my small flock of Marans – my very first! 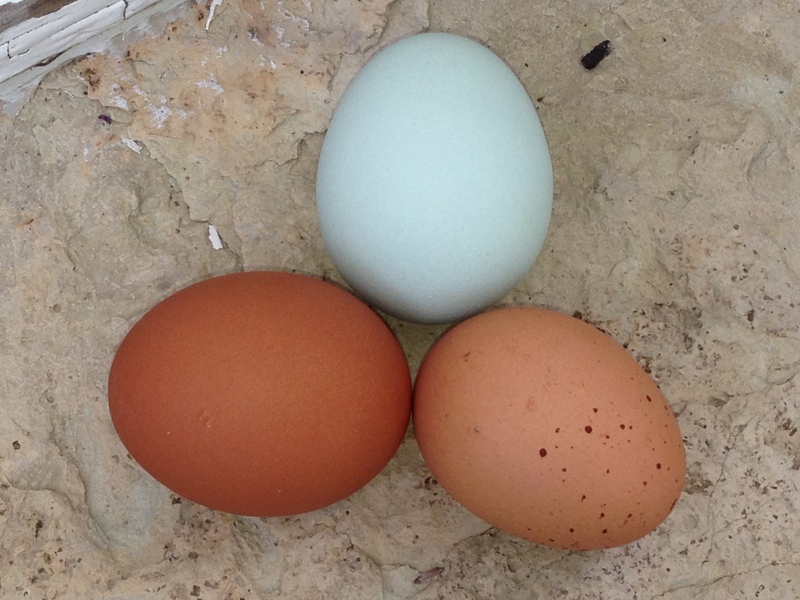 The Marans egg is on the left, Guinea on right and Americauna on top. 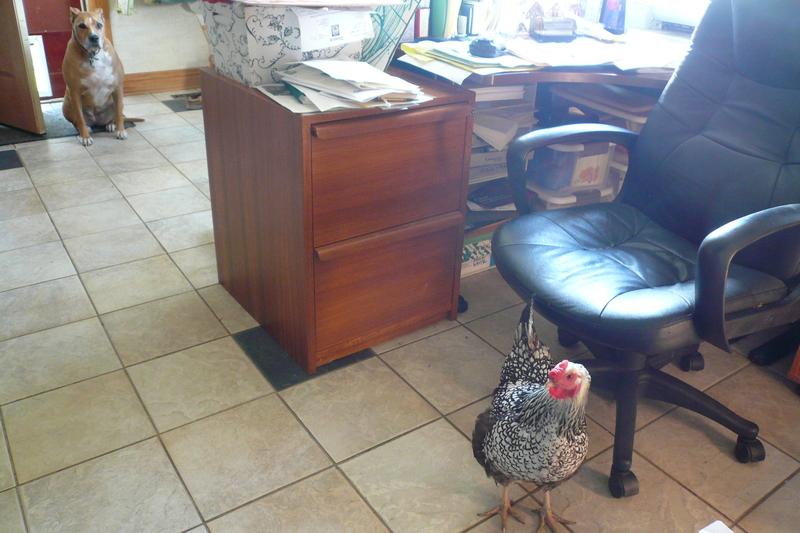 I started with chickens about 3 years ago. 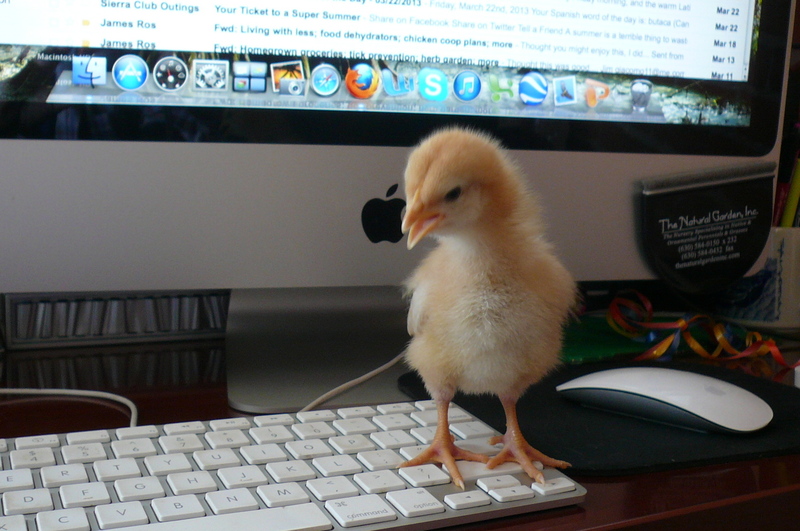 You just sit at your computer and enter each chick into your shopping bag. Wala! 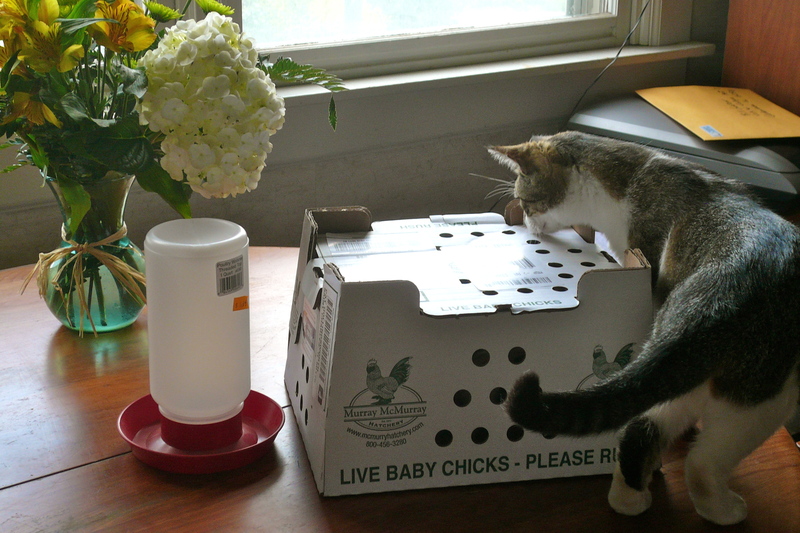 A few weeks later a chirping box arrives at the post office. This causes much interest on the part of all members of the household. 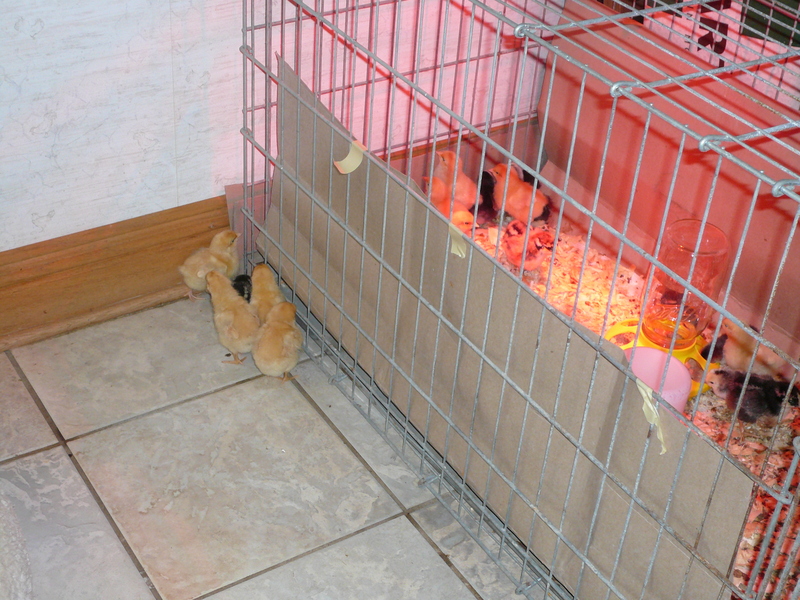 The worst part is keeping them in the kitchen until they are old enough and the weather is warm enough. After that it’s waiting, waiting, waiting until they are mature enough to lay. I’ve used a horse trough and a dog crate to raise them. Trouble with the dog crate is the little devils manage to escape it now and then. Then they can’t get back in! My young friends Kayla, Sterling, Jaden and Josie, came over almost daily to cuddle and play with them. 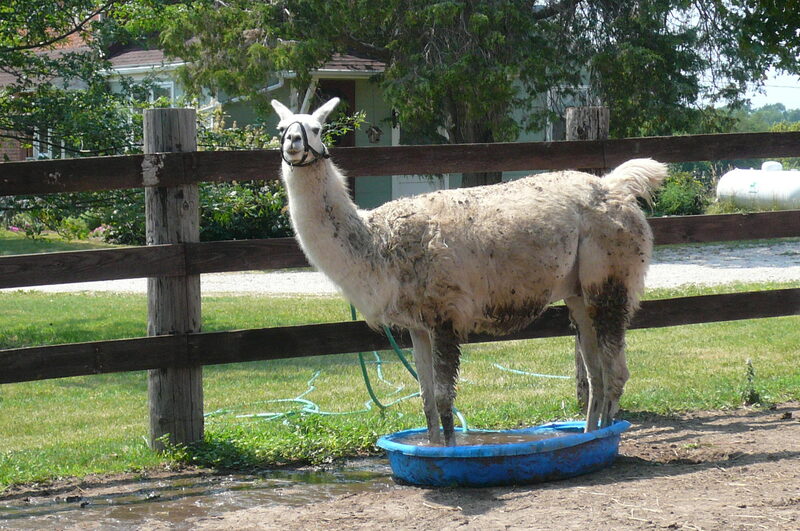 They also give them their names: Angel (Kayla’s favorite), Red, Popcorn, Bananas (the biggest), Stripe, Dusk, Smoke, Darth Vadar. 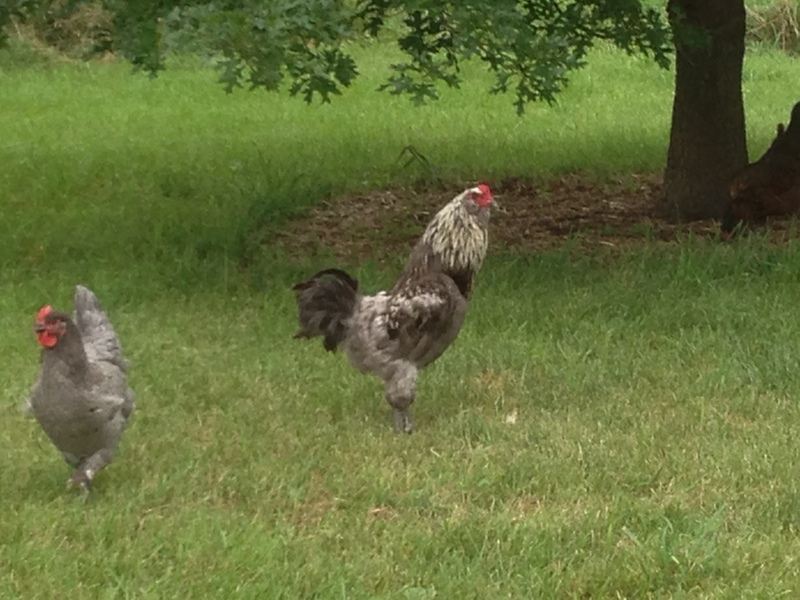 My first Marans came from a breeder I found near Carbondale. Natalie accompanied me to their farm and sat with baby chicks on her lap all the way back home. Alas they did not make adulthood. 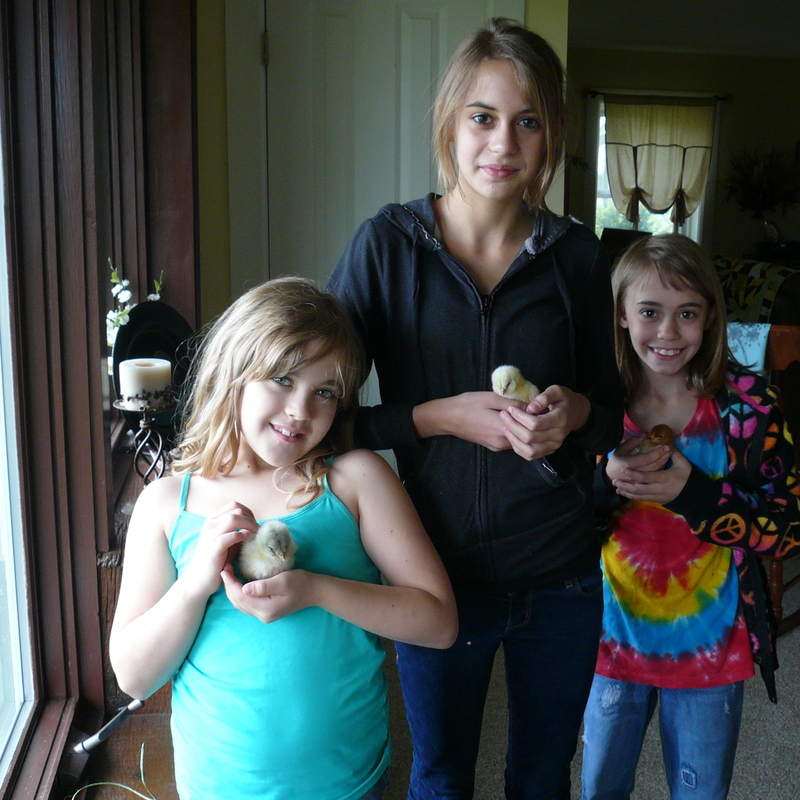 My second attempt was an order of 10 chicks from a private breeder in Montana, however she would only ship straight run. Seven made it to adulthood at which time they all began to CROW. So, they became coq a vin. Delish! Okay, so it’s NOT coq a vin, but it IS delish! 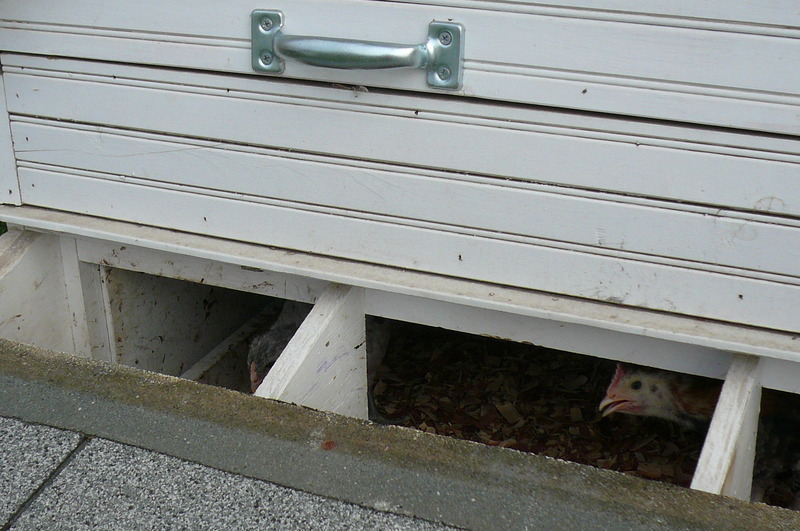 Then the catalogs started coming and I discovered that Meyer Hatchery offered them — pullets, too! 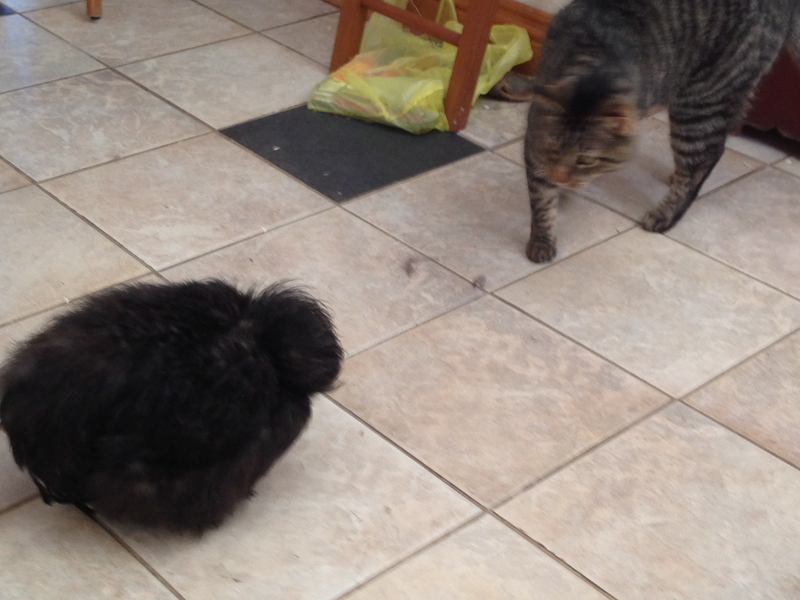 I now have 2 flocks of chickens. 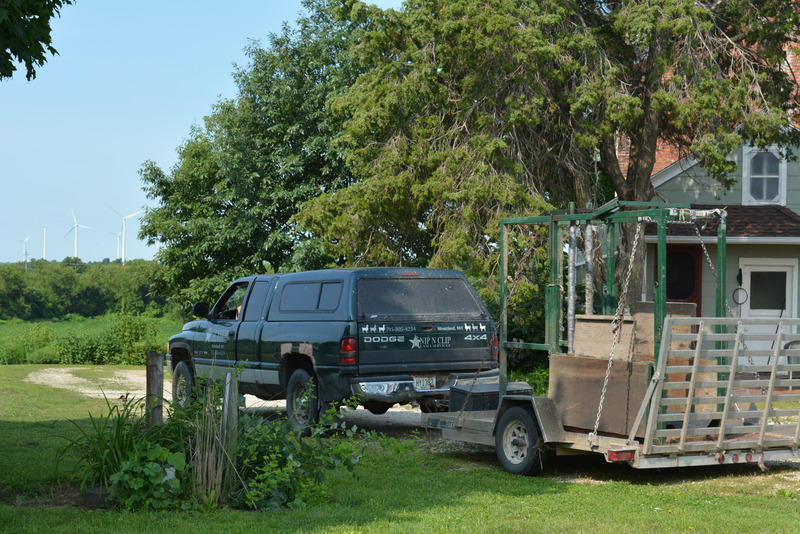 The older hens, an Araucana rooster and Guineas are inside the barn. 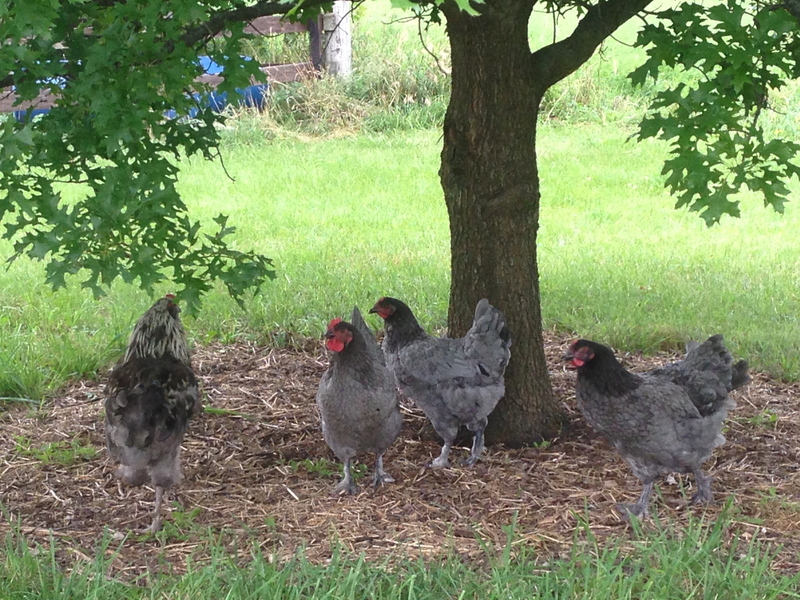 I keep my new flock, Blue Copper Marans and Golden Buffs, outside in a small, very cute little coop I got from my chicken friend Kathy when her flock – in Naperville – outgrew it. That’s Michael helping me set it up. 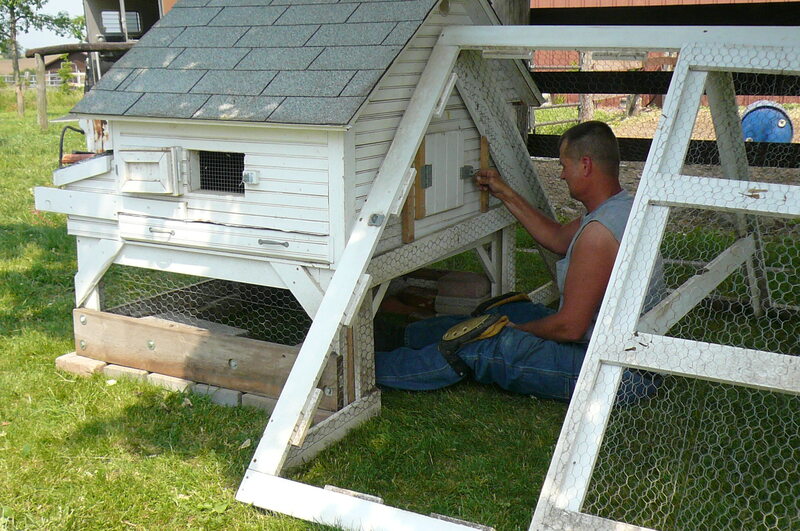 It has all sorts of cubbies and hatches that allow you access for cleaning or gathering eggs. 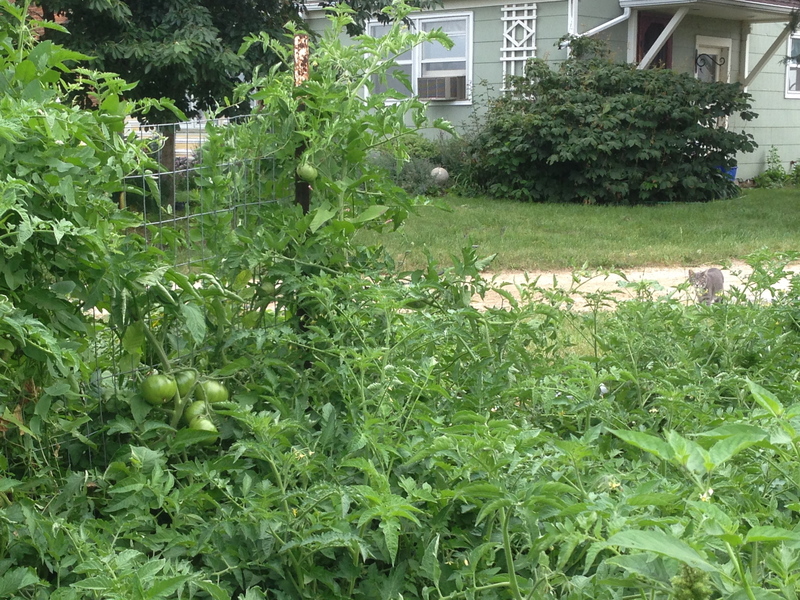 It’s adjacent to a raspberry patch and a jumbled mess of vegetation that you might call a “garden”. 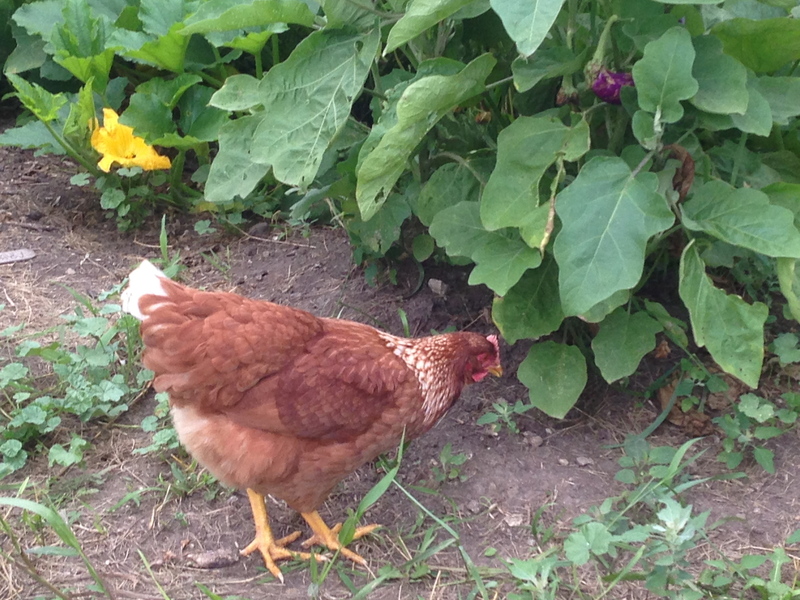 Chickens JUST LOVE the garden! 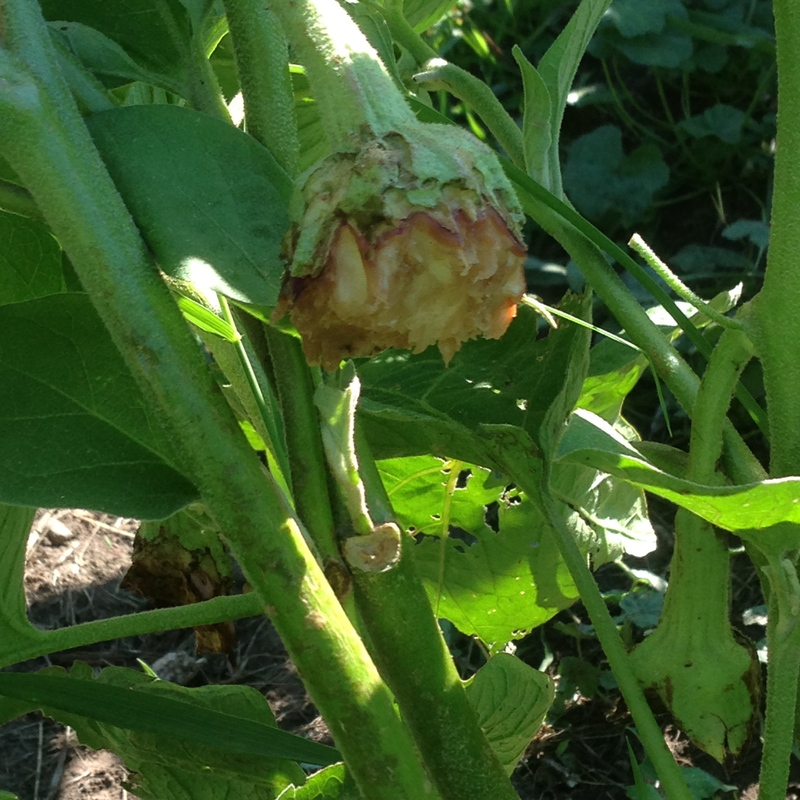 The eggplant has holes pecked in it and the only tomatoes that you can see are green ones. They do pick the seeds out of them though. Okay, scratch that, the eggplant is now GONE! 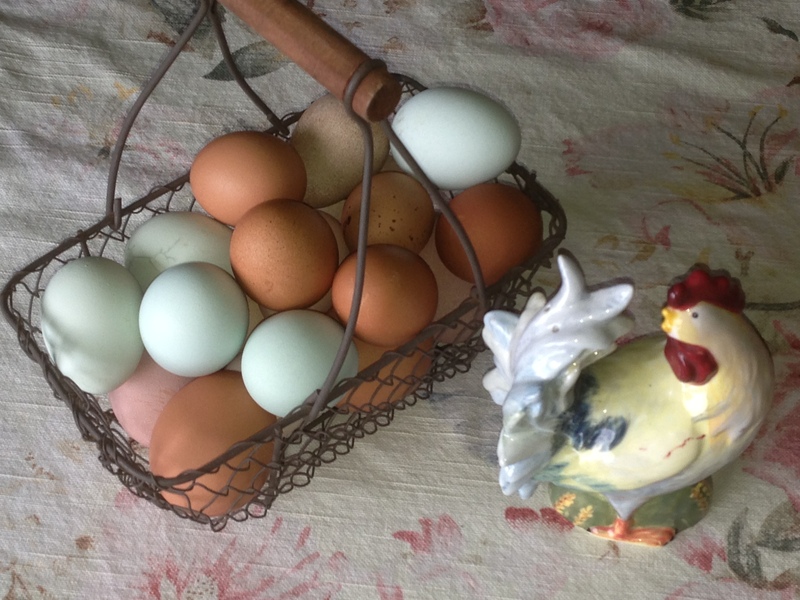 Do Marans eggs really taste better? Not sure I have that refined palate to tell but, I am told, taste is mostly in what they are fed, greens producing a darker, richer yolk. I cracked my first Marans egg – a double! 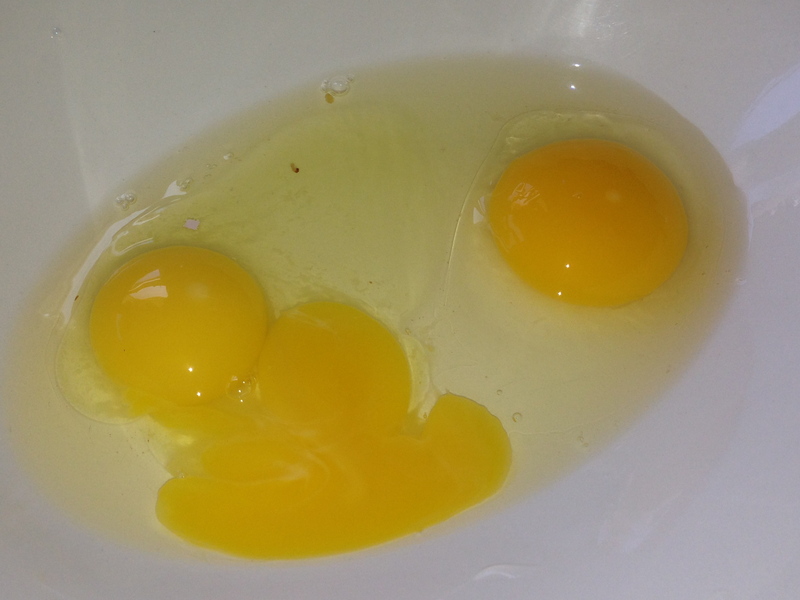 For comparison, a Guinea egg is on the right. 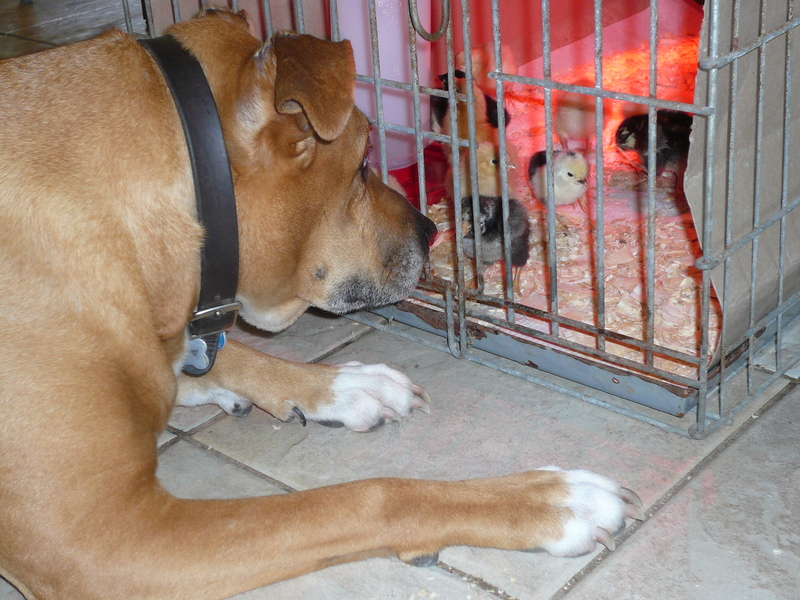 My entertainment — watching chickens. Better than tropical fish, TV or Netflix!